Ava definitely has an eye for fashion and the presentation thereof. For example, a few weeks ago we were packing for a weekend trip up to Preston, Idaho. 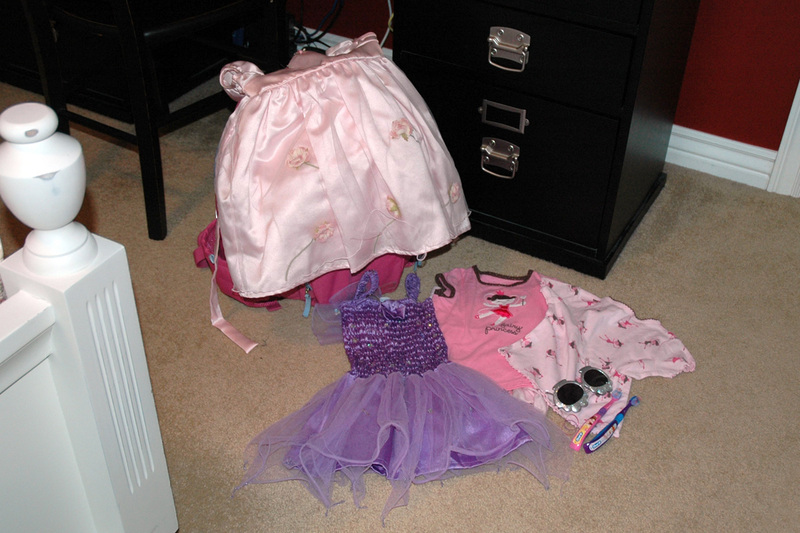 Without being asked to, Ava prepared everything she thought she'd need for the trip. She then came to inform us that she had packed her things. We entered the room to find this allotment of items displayed exactly as seen here. Lately, Ava has been spending a lot of time going through her closet and drawers pulling out all of her clothes and putting together outfits, which she then likes to showcase to us. 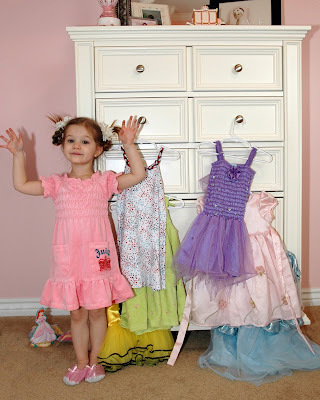 Here she is with a few of her favorite dresses on display. You may want to hire her—especially if you love leopard print and princess dresses. She can come help Katie pick out her clothes anytime :). Katie posed like Ava in the first picture and clapped fr her at the end of the video! Yeah AVA! I wish we could get the little cousins together sometime soon. I think Abby is old enough now that she and Ava could play together. It's fun to hear her talking and explaining everything. Seriously one of the cutest things I have ever seen! What a creative little thing! I'm so behind on all your posts, I've been out of the blogging world for a while. Glad to know about Liz having her baby, and Christian is darling, as usual! Super cute!..She's getting so big. I miss her so much and can't wait to see her and little jellybean in August.